Sens over Habs 4-2 -- This should be a fun series to watch. Ducks over Wings 4-1 -- Ducks are legit, and healthy for the first time in a while. 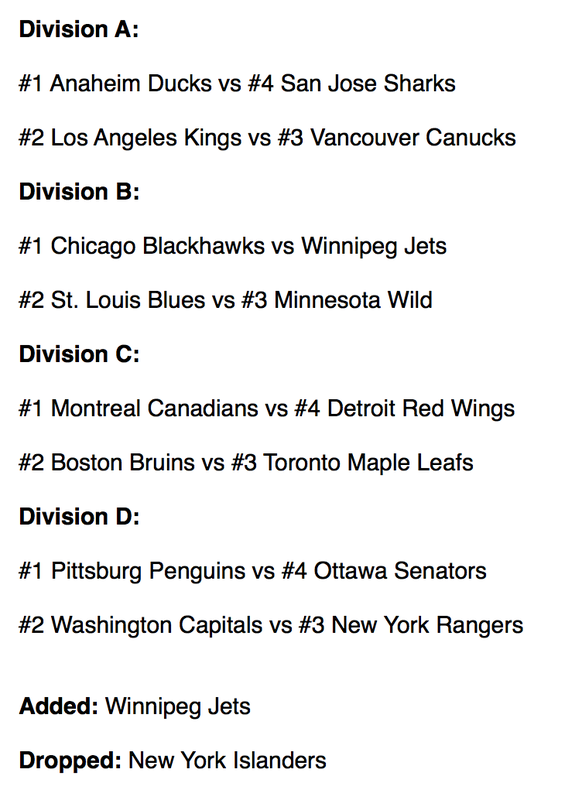 Here's how the first round would've looked under next season's realignment. Was that here last year or another site that scored the predictions? 5 points for correct winning team. 2 bonus points for correct # of games. Most points after 4 rounds wins. Rags in 5-though I hope they lose Lundqvist scares me. Chitown in 5. Minny would be my pick if they had more scoring depth.